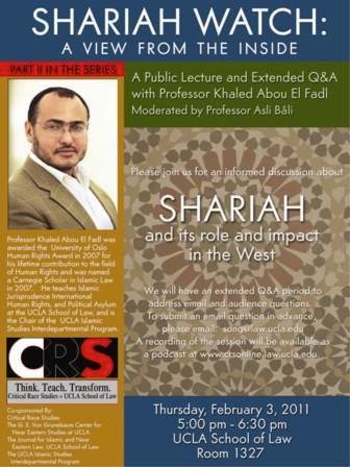 "Shari'ah Watch: A View from the Inside" blares the headline of a talk announced for Nov. 3 by the Center for Near East Studies at UCLA, "Lecture and Extended Q&A with Professor Khaled Abou El Fadl, Moderated by Professor Asli Bali. 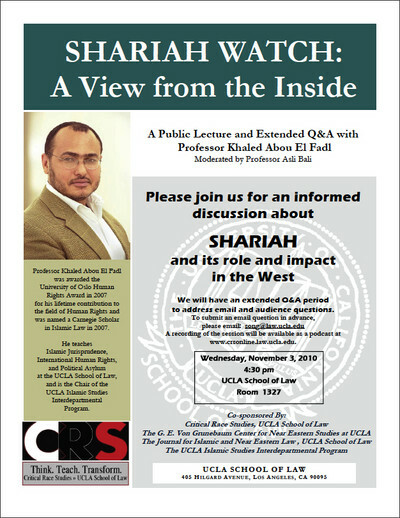 Please join us for an informed discussion about Shariah and its role and impact in the West." I, sadly, could not make it to the "informed discussion." Fortunately, however, the center posted an audio version of the talk by Abou El Fadl, a professor whom I have repeatedly criticized. For a Campus Watch report on the lecture as a whole, see "UCLA's Professor of Fantasy" by Cinnamon Stillwell and Eric Golub. They pay particular attention to Abou El Fadl's false statements about Robert Spencer and Steven Emerson – that's the "fantasy" in the title. His falsehoods about them are so egregious, they deserve to get Abou El Fadl sacked. Announcement of "Shari'ah Watch: A View from the Inside" by Khaled Abou El Fadl. The various discourses that we find by the Steven Emersons, the Robert Spencers, the Daniel Pipes's, the countless "watch" folks, the Jihad Watch folks – various pseudo-experts on whatever they wish to be experts on. Does it make a difference? Does it actually have a concrete effect in any form or context? Oddly, Abou El Fadl avoids replying to his own question but, obviously, his devoting a whole talk to us strongly suggests we do make a difference. at the same time that the Daniel Pipes's, the Robert Spencers, the Steven Emersons, the Glenn Becks … say "Well, in order for Muslims to prove to us that Islam can change, is capable of changing, we need to see a virtual civil war between the moderates and the others—extremists, militants, whatever you want to call them … something akin to a religious civil war in the Muslim world." At the same time, they often point to any inter-Muslim violence as evidence of the failure of these people as a people. For the record: We hope that moderate Muslims will challenge Islamists in the realm of ideas, not by starting a religious war or engaging in violence. does not necessarily mean that all Muslims are stealth agents, but, rather, stealth in the sense of sleeper cells, that Muslims, just being in the right set of elements, environmental elements, the right set of circumstances, and they will come into contact with this essential core of their faith and therefore, immediately become prone to turning jihadi or violent. No, that's another distortion: My article does not suggest that Abou El Fadl is a sleeper agent who might engage in terrorism; it argues that he is an Islamist posing as a moderate. when Pipes wrote this in the 1990s, I actually recall, I was giving a lecture at Irvine and there were a few professors attending the lecture and when I read this quote—in conversation with two professors afterward, they were basically saying "You're exaggerating. No one takes Pipes seriously; he's insane. Your concern about a statement like this shows your own cultural anxieties about fitting in as an immigrant [from Egypt]," blah, blah, blah. At the time, I have to admit, I thought "Well, maybe they have a point." But the Pipes-type discourse … was reserved and more civil than the discourses after 9/11. 9/11 presents a watershed moment where remarkably it becomes open season. Feb. 3, 2011 update: Now, this is odd. Yes, public speakers re-use the same materials and even the same titles. But the identical talk just three months later, with the same moderator, for the same organization, and even in the same room? How embarrassing. The only change is the shift in time, from 4:30 p.m. to 5:00 p.m.
Khaled Abou El Fadl gives the identical lecture three months later. But was it as brilliant? I wrote to the dean of the law school, pointing out that Prof. El Fadl was assiduously whitewashing and soft-soaping Sharia Islam, that in so doing he [El Fadl] was committing academic/scholastic misfeasance and malfeasance, and that these well-documented improprieties should be rigorously looked into by the law school. considerations of "academic freedom" would be of no value "if a faculty member were to be sanctioned every time he or she expresses controversial ideas or makes statements with which people disagree or find fault." I wrote back that I was not upset about El Fadl's championing of a retrograde, totalitarian, and fascistic legal system—it goes without saying he has every right to put that out in the free marketplace of ideas. But it is one thing for a legal scholar to cause controversy and debate by taking an unpopular position; it is quite another when the scholar obfuscates rather than clarifies a subject of study by engaging in subpar scholarship and outright deception. … She never replied to my second e-mail. speak out on this subject. That you stand up for the values of American and Western civilization, the same values that undergird the common law legal system, and that you confront the lies, deceptions, and doublespeak of Dr. El Fadl on behalf of Sharia Islam, a supremacist medieval-obscurantist belief system that has brought pain, misery, and darkness to the world for 1,400 years and counting (ask the Copts of Egypt). "Qui tacet consentire"—Silence is consent, and your silence so far has been deafening. Having had no answer to his appeal, Aaron is starting a public campaign for UCLA School of Law alumni to withhold donating money to their alma mater. Comment: If George Aaron needs help in his effort, Campus Watch and I are ready to assist. Jan. 14, 2012 update: George Aaron reports at "Prof. Khaled Abou El Fadl -- Pernicious peddler of poisonous piffle?" on his "campaign to discourage law school alumni from donating money to the law school until the longstanding and well documented charges of academic misfeasance and malfeasance against Dr. El Fadl are rigorously vetted by those responsible for the integrity of scholarship at the law school."